Making the extra effort to spoil your dog can have exceptional health benefits. Although there are multiple products that are natural or certified organic for keeping your dog clean, very few of them can leave their skin and coat silky and shiny without chemicals or artificial fragrances. Agatha's Apothecary's Natural Scented Dog Conditioner is filled with 89% certified organic ingredients, including lavender, bergamot, and aloe barbadensis leaf juice. Working together, these ingredients help heal and restore your dog's damaged skin and coat. The formula of our natural-scented dog conditioner moisturizes and soothes your dog's coat, making it easy to brush and wonderfully fragrant with the natural essential oils of lavender and bergamot. The natural ingredients also help to repel insects. This organic dog conditioner contains lavender and bergamot essential oils to produce a fresh smell. It does not contain any artificial fragrances or perfumes, which reduces skin irritation due to allergies. Agatha's Apothecary natural dog conditioner is easy to store and does not require refrigeration after being opened. Simply apply a small amount and work it well into the coat from head to tail. Leave it on for at least two minutes, allowing the conditioner to deeply penetrate and moisturize. Rinse well with warm water, towel dry, and enjoy your dog's soft, silky coat. We stand by our products and take our commitment to customer service seriously. NATURAL ORGANIC INGREDIENTS: Agatha's Apothecary's Natural Scented Dog Conditioner is filled with 89% certified organic ingredients, including lavender, bergamot, and aloe barbadensis leaf juice. 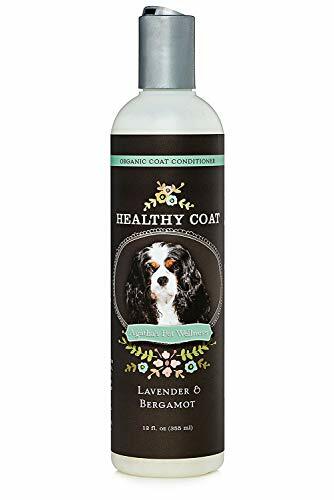 SOOTHES SKIN & COAT: The formula of our natural-scented dog conditioner moisturizes and sooths your dog's coat, making it easy to brush and wonderfully fragrant with the natural essential oils of lavender and bergamot. The natural ingredients also help to repel insects. NO PERFUMES OR ARTIFICIAL FRAGRANCES: This organic dog conditioner contains lavender and bergamot essential oils to produce a fresh smell. EASY TO STORE & APPLY: Agatha's Apothecary natural dog conditioner is easy to store and does not require refrigeration after being opened. MONEY BACK GUARANTEE: We stand by our products and take our commitment to customer service seriously. We offer a 100% money back guarantee. If you have any questions about this product by Agatha's Pet Wellness, contact us by completing and submitting the form below. If you are looking for a specif part number, please include it with your message.